TERO Commissioners Tisha McLean, Ryan Gobin, Helen Gobin-Henson, Eliza Davis and Dale Jones. Within the past four decades, Tribal governments have made tremendous strides in identifying and protecting the rights, resources and opportunities of their people. Tribes are effectively exercising self-governance to protect their water, timber, hunting, fishing and gaming rights in order to garner maximum economic returns and opportunities from the use of their resources. This type of effective advocacy is being brought to the protection and assertion of Indian and Native Employment and contracting rights by approximately 300 Tribal and Alaska Native village governments that have established Tribal Employment Rights Ordinances and TERO enforcement programs (source: Pacific Northwest TERO). Here at the Tulalip Tribes we are fortunate enough to have a fully staffed TERO department that is knowledgeable and well-equipped to protect the unique and special employment rights of Native Americans. Tulalip TERO is a member of the Pacific Northwest TERO region, which covers Washington, Oregon, Idaho, Northern California, and portions of Nevada and Alaska. Our national organization is the Council for Tribal Employment Rights. We are also fortunate to have the Tulalip TERO Commission comprised of Chairman Dale Jones, Vice-Chairperson Helen Gobin-Henson, Secretary Tisha McLean and Commission members Eliza Davis and Ryan Gobin. Together, the TERO department and TERO Commission serve to access more employment and training opportunities for Native Americans and their families, and to provide more business and economic opportunities for businesses owned by Native Americans. Since the unemployment rate in Native communities remains high, Tribes must take strong actions to protect the employment rights of Native American people. In protecting the employment rights of Tulalip citizens, the Tulalip TERO department and Commission administrate the TERO Program to enforce and ensure workforce protections, preferential employment and contracting rights. They assist and refer clients for education, training and services to succeed and enhance their career and economic opportunities. Their mission is to ensure preference in employment, contracting and economic opportunities, while providing vocational training opportunities with the outcome of employment. 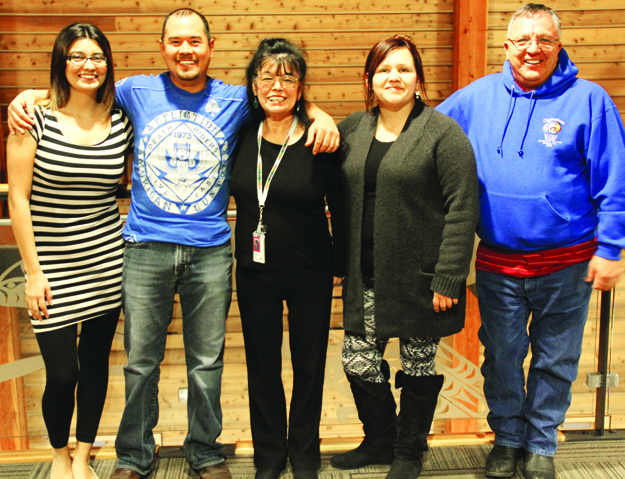 The current TERO structure in place has been widely successful, evident in the current Tulalip preference scale found in the Central Employment hiring guidelines and the ever expanding vocational training center that has made employment dreams a reality for so many tribal members. As the Tulalip Tribes, tribal membership, and policies continue to evolve, so does the social and political climate for Tulalip TERO. Each member of the TERO Commission, each a Tulalip tribal member, has a different set of objectives they would like to see achieved in 2015. While the objectives may vary from person to person, the overall goal is the same; to protect the employments rights of Tulalip citizens while providing them with the training and education to improve career and economic opportunities. This entry was posted in Tulalip News and tagged employment, rights, TERO, Tulalip Tribes by Kim Kalliber. Bookmark the permalink.